Despite reasonable argument put up by the Super Eagles coach, Gernot Rohr over the alleged inadequacies discovered at the Stephen Keshi pitch, Asaba stadium, not being good enough to host the international friendly against Egypt, the Delta State government is set to allegedly lavish tax payers’ monies on the Super Eagles. 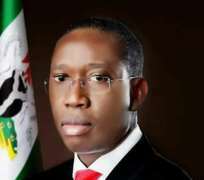 Reports also alleged that the state governor, Ifeanyi Okowa, has extended the goodwill to the visitors in the March 26th, 2019 friendly clash between the two Africa’s biggest teams just as the Nigeria Football Federation (NFF) is bent on Asaba, hosting the event. Although, the state government is yet to come out with a statement refuting the claims of NFF on its readiness to host the sport event, there are indications that the silence of the government affirms the assertion of the Glasshouse big shot that salacious rewards awaits the Eagles in spite of claims that there is dwindling federal allocation coming to the state and low Internally Generated Revenue (IGR), generated in the state. It was gathered that the state government was ready to take 80 percent of the bills to host the international friendly billed for March 26, 2019, some three weeks after the governorship election. It was also learnt that the NFF was motivated to choose Asaba, as the host will also provide attractions for soccer fans, as they aim to make everyone who turns up for the match enjoy the game and atmosphere.